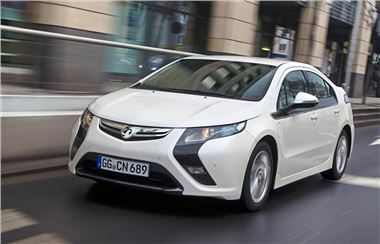 Ahead of the Vauxhall Ampera's UK launch in 2012, the electric car is about to take on its longest ever road run ever in the UK. A team of drivers will share the journey on Tuesday 22 June. The Ampera will set off from Vauxhall's Luton base to the company's factory in Ellesmere Port, Cheshire, where the new Astra is built. This is a total of 170 miles, though comfortably within the Ampera's claimed touring range of 350 miles. Along the way, the Ampera will travel along the M1 and M6 motorways, take in Birmingham and will cover the first 40 miles of the trip solely on electric power. The Ampera uses an electric motor powered by a lithium-ion battery. When the battery's charge drops, it is recharged by a small petrol/E85-fuelled engine that acts as a generator, so the Ampera is not a hybrid in the same sense as a Toyota Prius or Honda Insight. Vauxhall's Managing Director, Duncan Aldred, will drive the first leg of the Ampera's historic journey. He said: "It's poignant that Luton marks the starting point of this trip and also the starting point of E-REV (extended range electric vehicles) in the UK."